Flying. Travel by Magic. | Life. Crazy. Beautiful. 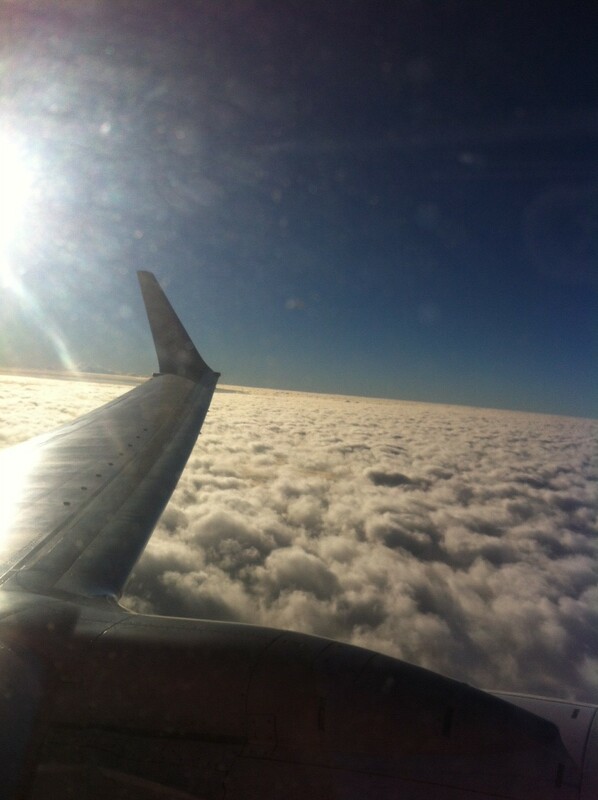 I love flying. Every bit of it. Hearing the pilot say, ‘We are off to the south tracking via Wollongong, conditions in Melbourne are clear and 18 degrees’. I love watching the workers on the tarmac that look suspiciously like the Doozers from Fraggle Rock. But the absolute best bit is the take off. Sitting there on the tarmac as the engine builds, then, with both feet firmly planted on the floor (this is important), the race forward, adrenaline rushing through your whole body and – you are in the air. In the air people. Flying at a gozillian miles an hour – looking down on the world. A world that when you are in it can be busy and stressful and harsh. But from up there, it is always beautiful. Breathtakingly beautiful. When I’m down in the world, sometimes I look up at the planes in the sky and wonder: How do they stay up? Well, the answer is – its magic. I know this for a fact, because when I was living in Oxford I had a few flying lessons. One of the incredible things I learnt was that once you are in the air, the plane pretty much flies itself. You don’t have to pedal or anything. I remember thinking: Really? We just sit here and don’t fall out of the sky? They then told me one of the most important things to learn was how to stall. Yes – stall the plane as in make the engine cut out – and then recover. I guess they thought the whole letting the plane fly itself thing wasn’t exciting enough. Now – I am quite an expert in stalling. I do it in my Yaris at least once a day. Recovering at the lights while the person behind me is beeping I am well versed in. But recovering whilst floating mid-air in what is the aircraft equivalent of a Torana is another story. I decided to quit while I was ahead. Chicken Run feels like how flying should be, us all peddling madly as we lurch into the air screaming at the top of our lungs. But instead, we sit in our comfy chair, sipping our iced water, reading a book or watching a movie. We barely even notice the beauty passing outside the window. I usually take a while to get to my book. I can occupy myself for a good while watching the clouds. The top of the clouds. You are above the clouds people. Taken with my phone from my window seat. Yes it was in Flight Mode. I’ve lost count how many airports I’ve been in, let alone flights I’ve taken. But still every time I go to the airport, every time I get on a plane, I love it. How could you not? It’s magic. This entry was posted in Uncategorized and tagged flying, inspiration, magic, travel by Nimmity. Bookmark the permalink.